The A.V. Club hasn’t traditionally structured its year-end round-up with some authoritative ranking, choosing instead to look back at the myriad experiences we had in games over the year and sorting for the ones we really, truly liked. The result is a list that’s as true to our writers and their own predilections as it is to the year that was. 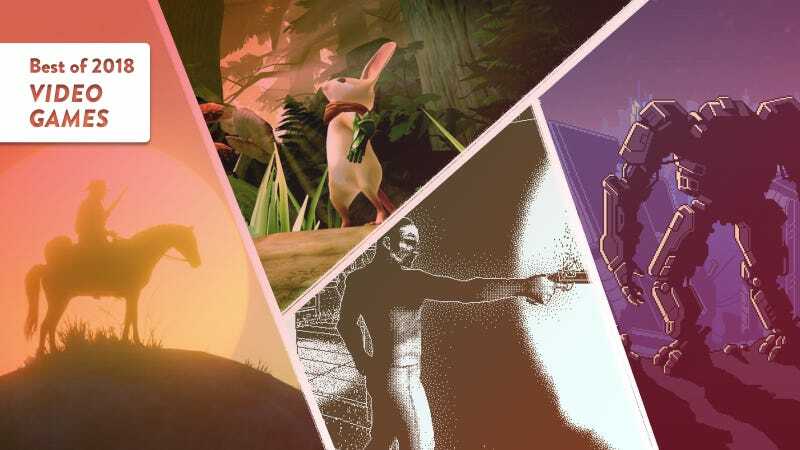 There isn’t a clean-cut narrative to the games that stuck with us in 2018—which span massive superhero extravaganzas, elliptical horror experiments, and psychedelic VR rhythm games—which is, truly, proof of how rich and exciting games can be. As always, you’re invited to write your own retrospectives in the comments, following the rubric laid out here. Feel free to overlap with our own picks; we’re interested to hear why you liked these games, too! We’ll collect some of our favorite responses for our annual Games You Liked round-up on Wednesday. I liked Bloodstained: Curse Of The Moon because it shamelessly imitates something great. I still think about parts of Castlevania III—the sickly green timbers of the pirate galleon; the hellacious ascent to the source of the Outer Wall’s electric blue waterfall; the powerful name of my sidekick, Grant Danasty—all the damn time. The world is overrun with Metroidvanias, but the NES Halloween aesthetic of an old-fashioned Castlevania can feel as distant and dreamy as the era of silent film. Screenshot: Matt Makes Games Inc. I liked Minit because it’s concise. Most games like it, that do the whole swords-and-dungeons deal, are long-winded affairs, taking hours to set up narrative, seed mechanics, and just generally get going. Which is fine and all, but sometimes I want to get some cool items and fight some bosses, y’know? Sometimes you just want to get to the point. I liked Monster Hunter: World because it makes me incredibly hungry. Holidays are the time to return to Monster Hunter, gaming’s horn of plenty, filled to the brim with grumbling little Deviljhos and Kirins. Every day in Astera is a feast day: Lordly cuts of monster steak and grilled fish arrive steaming, hoisted over the ears of the smiling cat-servants (Is their service voluntary? Don’t ask) who prepare the hunter’s banquet. Thus fortified, you track the New World’s titanic beasts, a cornucopia of dinosaurs and dragons, all bulging with the good meat and bones needed to continue your endless celebration. Sometimes you capture one alive, humanely, allowing your researchers to somehow extract even more of its hide and skeleton (don’t ask). I liked Red Dead Redemption 2 because it never ran out of surprises. Did you know, for example, that strangers can visit your campsite? It happened for the first time about 60 hours into my game, when the ritual of cooking alone was as familiar as Arthur Morgan’s battered black hat, and the sudden appearance of a wild-haired woman by his fire at night was a genuine jump-scare. An hour later I came across a rival gang of outlaws robbing a train, which I had never seen in all my hours of stick-up artistry. Look at all these games!